How many sweets and chocolates are in a sweet tree? - This varies on the style of tree. as an example, our Sweet Pick n Mix Tree would have approx 200 sweets on a small and 500 on a large, where as a Ferrero Rocher tree holds approximately 23 chocolates on a small and 40 on a large. Please feel free to get in touch with us to enquire about amounts of your desired sweets and we can give you an accurate estimate. Are the sweets and chocolates nut free? - We have a variety of suppliers and therefore cannot guarantee our sweets and chocolates are 100% free of nut traces. How long can you keep the sweets and chocolates for? - Covered sweets and chocolates can be kept for 6 months, providing they are kept out of direct sunlight and stored at an ideal temperature of 18-20 degrees c. If the sweets are uncovered and in a tight container they can be kept for approximately 2 months. Is the head of the tree fully edible? - No the centre of the sweet tree is NOT edible. Do you set up Sweet Trees at events? - Yes we can do if in our catchment area. We agree the set up details with you and confirm this in your booking confirmation. Is there a delivery charge? - The delivery charge to any UK Mainland destination is £6.99 per order. Scottish Highlands & Offshore Islands delivery costs slightly more, please see delivery section for further information. You can also purchase an order to collect for free from our store at a date of your choice if your local to collect, please select 'collect from store' when at the checkout. How do we make payment? - Payment can be made by debit/credit card, by Paypal or by BACS Bank Transfer. How much notice is required when placing an order? - We dispatch orders within 3 working days and then dispatch via Interlink Next Day Delivery, the majority of our goods available on the website are made to order which is why we do need the extra time to create them before dispatch. If you need an order quicker or would like to see what items are ready made and available for immediate dispatch, please phone us to see if we can do this for you. We do stock a majority of our creations in our local store ready for sale so please call us if you require a gift sending quickly and we can tell you what is available for you. Can we use your pictures and designs off the website? 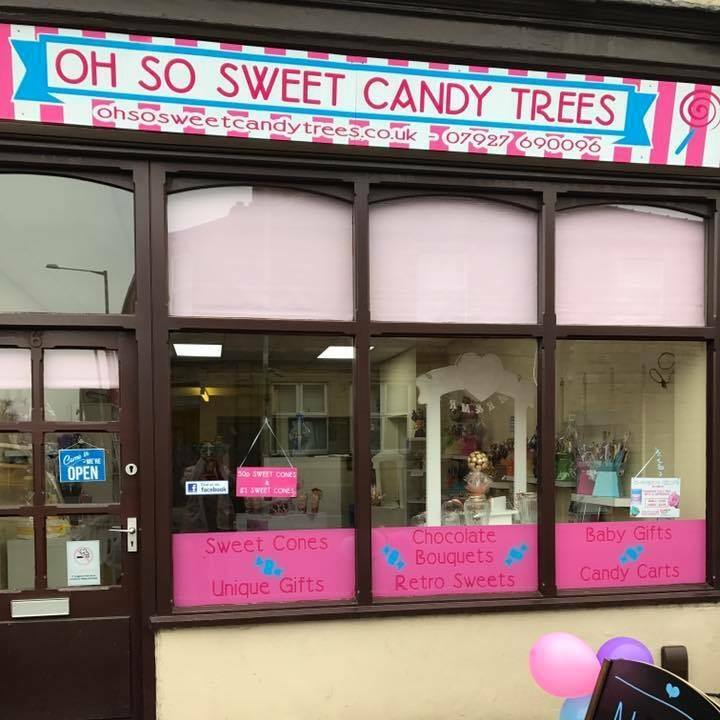 - All designs on www.ohsosweetcandytrees.co.uk are British Design Registered under the UK Copyright Service. And all our imagery is copyrighted. This prohibits the recreation of our products and the use of our pictures. Should you wish to use any of our designs or pictures please write or email us first for permission. What are the sweets attached with? - We use non toxic glue to attach wrapped sweets & chocolates to the trees, and cocktail sticks for various other trees. A guidance sticker will be attached to the sweet tree head base with useful information for the sweet tree you have purchased. We do advise that children under 3 years of age be supervised if eating from a sweet tree which has cocktail sticks within it.